Remain health inspector compliant with this non toxic solution for fly removal. Every fly removed, while your customers enjoy the experience of your business — unaware of the nuisance of flies. If you have flies your losing business and customers are writing bad reviews on social media about your reputation! The Mergence was engineered to be unnoticeable to customers. The mechanism for removal is hidden inside the dome for a more clean and sanitary look. To customers, it appears to be an ordinary wall sconce. It comes in two colors black and white, white is paintable to match any color of your wall. It features a 14 foot long power cord for easier access to more installation areas. Flies have been scientifically proven to spread harmful diseases like typhoid, cholera, dysentary, E.coli, and salmonella. After landing on animal feces, within a few seconds the fly's body can become a carrier of these pathogens. Later when the fly lands on food, these micro organisms can reproduce and be harmful to humans if ingested. See just how amazingly effective the Mergence fly control system is on our YouTube channel: youtube.com/ZepolLabs. Engineered, designed and tested by biomimicry from Carrion Plants.The Mergence is designed to appeal as a simple sconce light. 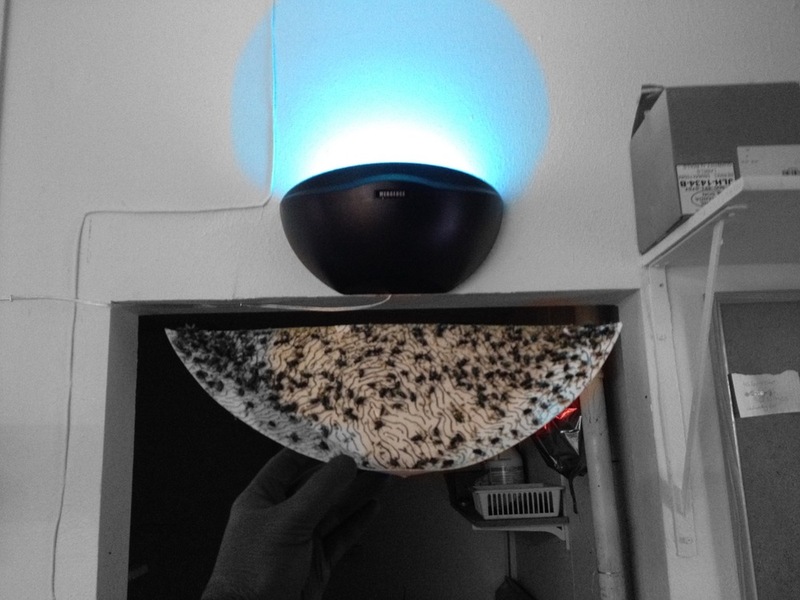 The Mergence fly light caught 77% of 300 flies released into a 144 square foot room within 2 hours. Effective against house flies, filth flies, bottle flies, fungus flies, yellow jackets and moths. Meat butcher after only 24 hours of installing the Mergence fly control system. Test results of 300 flies released into a 12ft x 12ft room for 2 hours.